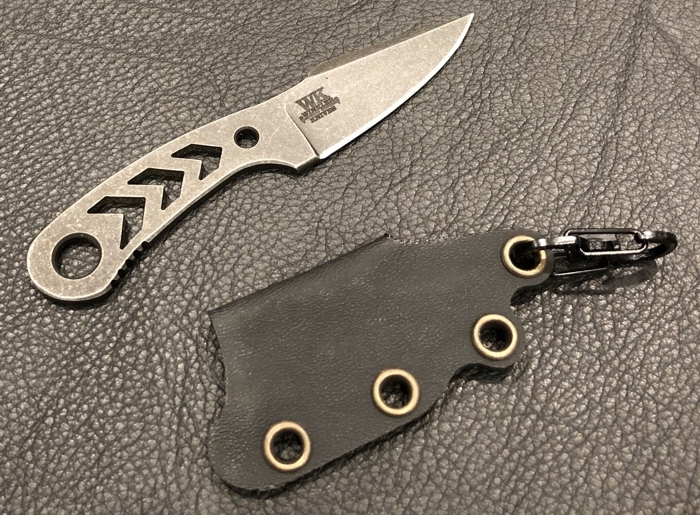 **** Chosen by Winner: Larry M.
Winkler Knives is a limited production company that custom manufactures a diverse line of high performance edged tools. It was established in response to requests from within the SOF Community for specialized breaching tools and has become widely acclaimed for its no frills approach to tactical and rescue operations. Winkler Knives’ products boast attributes such as tapered or skeletonized tangs, no-glare finishes and multi-option carry systems. Each tool is made from specialty steel best suited to the intended use of the equipment. Our unique processes, executed by craftsmen under the direct supervision of Master Bladesmith Daniel Winkler, result in handmade knives and axes without custom made prices. Winkler Knives has had the honor of providing Team specific knives and axes to some of America’s most elite fighting forces since 2004. The Company’s history of producing custom-made cutlery, as well its origin in working with Special Operations, began long before that. Daniel Winkler began making knives in 1975 and became a fulltime bladesmith in 1988. He earned accreditation as a Master Bladesmith from the American Bladesmith Society in 1993. As a historical enactor, he drew inspiration from the knives and axes of the American Frontier- a time when the tools a man carried meant sustenance and survival. That influence translated to a recognizable style that brought Winkler and his sheath-making partner Karen Shook widespread fame. That same influence remains evident in the tools created by Winkler Knives today. Winkler’s focus on Early American weaponry led to his making knives and axes for the motion picture LAST OF THE MOHICANS. As unlikely as it may seem, that job led to his working with SOF Teams from around the world. Just after ‘MOHICANS’ was released to theaters in September 1992, a Navy SEAL based in the Virginia Beach area having just returned from deployment in Operation Desert Storm, was tasked with sourcing a high-performance breaching/combat axe. After watching the film, the SEAL inquired as to who made Magua’s tomahawk. As Winkler was the maker, the SOF Operator contacted Daniel. What followed was the first Winkler Knives Breaching/Combat Axe. The Operator immediately recognized the virtue of an integral full tang axe with a combat spike, however, funding issues prevented the project from becoming a reality. The SEAL personally purchased the prototype axe, carrying it with him on every deployment for the remainder of his Naval career, and after military retirement as a game warden in North Carolina. The world changed on September 11, 2001, as did the life of the former SEAL who first approached Daniel Winkler in the early 1990’s. The retired combat veteran re-entered service in Army Special Operations. Before long, his full tang axe was back in action. As his new Teammates and fellow Warriors saw the effectiveness of the axe, Winkler was asked to make more. Demand soon exceeded Daniel’s capacity to hand forge the axes. The proven performance of the axes prompted additional projects. Special Ops translated to special needs. In response, Daniel developed technology to increase production without any compromise to quality or performance. The end result- Winkler Knives.